Spellbinders™ Nestabilities® basic shapes and labels are the core of the Spellbinders line. Use individually or nested together for perfect mats, or use them to create frames and shaped cards. Unique and versatile, Spellbinders Nestabilities die templates are a quick and easy way to bring a professional look to any paper craft project. Intricate cuts around an outline of our Labels Twenty-Eight to create a beautiful design. This set coordinates with other 5 x 7” die template sets in the CARD Creator collection. Set of five Nestabilities® die templates.Ovals are perfect for card making, home décor or scrapbooking projects.The difference between die template sizes within a Nestabilities set is ½”, which becomes a ¼” border when layering. Set of 4 templates. Spellbinders Imperial Gold die templates cut, emboss, stencil and deboss, giving you the ability to cut and create in multiple layers with a single die template. 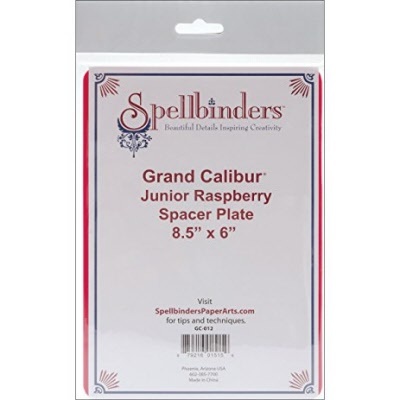 Rubber mat for your Spellbinders Grand Calibur machine. Use to emboss the detailed images of Spellbinders dies and Spellbinders Impressabilities templates. The dies and embossing plates from Spellbinders are the most advanced available offering a triple action - cut, embossing and stencil with the same die. Woodware punches are precision instruments for cutting paper and thin card. Perfect for embellishing scrapbooks, paper crafts and stationery. Select from our collection of rubber stamps from Stampendous, Woodware and Magenta. All rubber stamps are fixed on a substantial wooden block with grooved edges for a firm grip.